Does working in the Theatre Industry guard against the associated effects of walking onto a stage to receive a surprise award? The jelly-like limbs, the escalating thump-thump of your heart, the Kalahari-desert dry mouth, the evil little voice inside your head repeating: ‘You are going to screw this up! You are going to screw this up!!’?? Answer: No, it does not! But (somehow – who knows how) we showed those Evil Little Voices. Although this is the most recent of a number of awards for FTH:K, this was first time that Jayne and I were receiving an award on behalf of the Company – which would have been nerve-wracking in itself. Add to this the fact that we had no inkling that we would be expected to do so, and you have a serious case of adrenalin-rush! But nerves aside, what started as an unassuming email-invitation from the Distell Foundation, ended as one of the best surprises Jayne and I (and the rest of the team) could have hoped for. 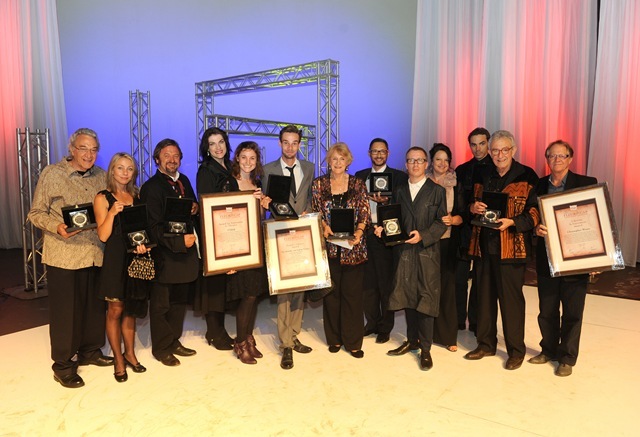 Recognition for “Innovation in Theatre”. Eish. What more could a little theatre company like ours ask for? For years we have pushed for our audiences, supporters, critics to look beyond the obvious development angle of what we do, beyond the socio-political impact that our work has, and critique us on what we put onstage. Similarly, our creative team has continually pushed itself to keep refining our artistic product so that our work can compete on contemporary stages, and so that we could hear our favourite post-production audience comment more frequently: “So…were there Deaf people in that show?? Which ones were they?” Quite simply, we have fought hard to get rid of the “ag, shame” factor and be reviewed on the same grounds as any other theatre company. 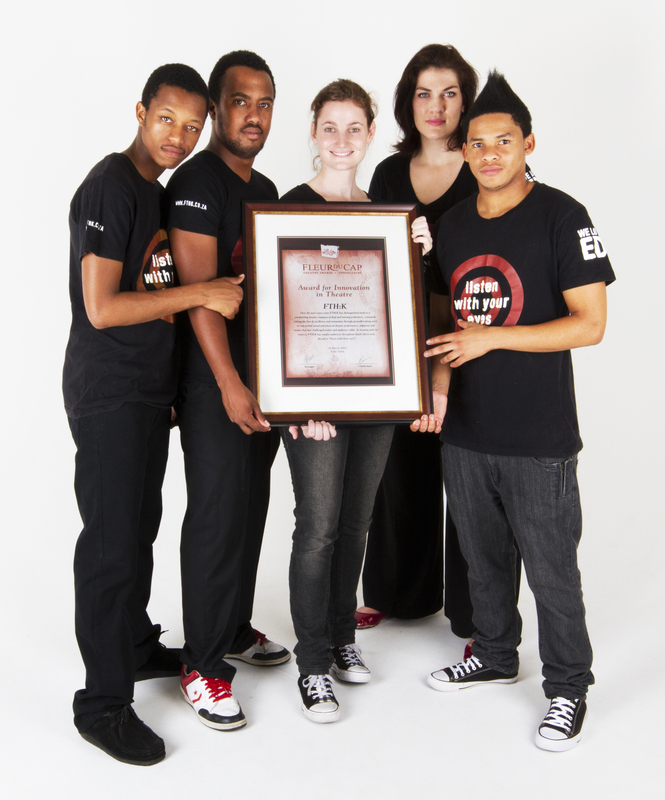 An award for Innovation in Theatre says that we are achieving this. Which is a rewarding in and of itself. Fast forward to champagne, camera flashes, congratulatory kisses, happy hugs, excited phone calls, international messages, and you have Jayne and I wrapped in the warm glow of shared accomplishment. And the shared part of it is really important to us. This award is ours: collectively. As we did on the night, we share this achievement now: with Tanya and Rob; with Marlon, Christo, Sinethemba, Christine, Dee, Sherna, Merryn; with Tomri, Liezl, Lysander, Gali, Simangele, Angela, Yusrah…and and…(this page is just not big enough! )…and all the amazingly talented collaborators and individuals who have worked with us in the past; as well as our awesome FTH:K family and supporters; not forgetting our beloved funders, donors and industry partners who have jumped on this crazy ride with us! And so with this one, we join past recipients of this award that, in the words of Fleur du Cap Judge, Gillian Mitchell, ‘…attest to innovation in the performing arts which requires in equal measure ingenuity, resourcefulness and sheer old-fashioned nerve’. Here’s to sheer old-fashioned nerve – the FTH:K way!